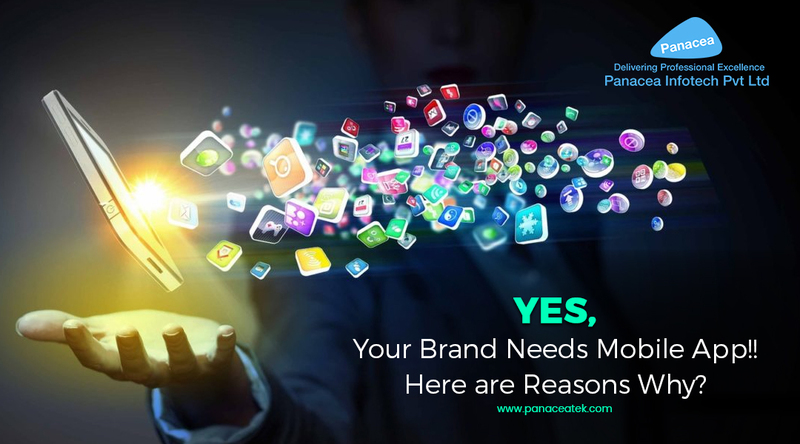 Yes, Your Brand Needs Mobile App!! Here are Reasons Why? Every business needs to have a website to provide information to its customers. It is becoming increasingly evident that businesses now need to make receiving this information a convenient experience for their customers. If your business is interested in growing, increasing profits and building brand advocates, then it definitely needs an app. This was the case with websites or any kind of web presence about a decade ago. Even an eCommerce development platform with shopping carts was good to have options. When it comes to web presence in the year 2017, still the question of whether it’s important for your business is somewhat amusing. Today, it is nearly impossible for a brand to survive without a website. So, at a time when the Internet was not considered to be significant, brands that adopted digital behavior benefited the most when their users started going online. About 5-6 years ago, a necessity of app would have been dependent on many factors. But, today the most common answer that the marketers have for large and small businesses is if you don’t want to fall behind the competition, get one. In the last few years, mobile apps have outgrown the ‘nice to have’ phase and play a very important role in optimizing user experience. They are brand driven, signify interactive experiences and have been optimized for various platform rigorously used by the users currently such as smartphones, tablets, or even the novel wearable devices. So, most businesses have come to a realization that it needs a mobile app. According to experts, annual investment in apps in 2016 was around $6 million and every study was showing that users were spending more time on their apps than ever before. The Choice is All Your! For every business, either online or offline, creating a great customer experience is essential to building a solid consumer base. In this competitive world, this is what brands really strive for. So if a mobile app strategy model can help you achieve this then this alone can be a significant reason to develop a mobile app for your brand. For example, Uber managed to capture almost 50% of the taxi and transportation industry and their app is the backbone of their success. Thus, apps can be very powerful and help in tapping the innovation zone. If your brand app can provide a unique experience completely different from what your website does, then it can win over your customers and improve brand loyalty by a large degree. The mobile app revolution has ensured that most of the consumers today use mobile apps. This also means, that in order to capture and understand this user base you need to develop an app. Consumers interact very differently with brands via an app, it is at a more personal level. So in order to gain a deeper insight into mobile app behavior, your personal app can showcase how your user engages with you. Having an app can give you an opportunity to use app analytics, which can provide an understanding of your target actions of users. This will enable you to create a more powerful and personalized mobile experience. The demands and expectations of the user are increasing every day. By developing an app you can create a more personalized user experience, which can make it more relevant and exciting for your target audience. This is not completely possible even when you have a responsive website. An app can give you a deeper insight into the demographics and the behavior. This can enable you to build custom experiences catering to the different segments formed through the insights. If you have come to a conclusion that incorporating the development of an app as a part of your business strategy can be really beneficial for your brand, then go for it. However, in order to make it a success, you need to provide a useful and a unique service, which differentiates it from not only the other apps in the market but also from your website. To keep up with your customers and your competition, your business really does need an app. Your customers are looking for a brand experience that makes their life easier, don’t be the last to give it to them. Panacea Infotech is one the leading mobile app development companies that can help you to get an enterprise app to build your business. We have a team of expert developers and digital marketers who will help you to increase your profits, inspire brand advocates, and keep you ahead of your competition.